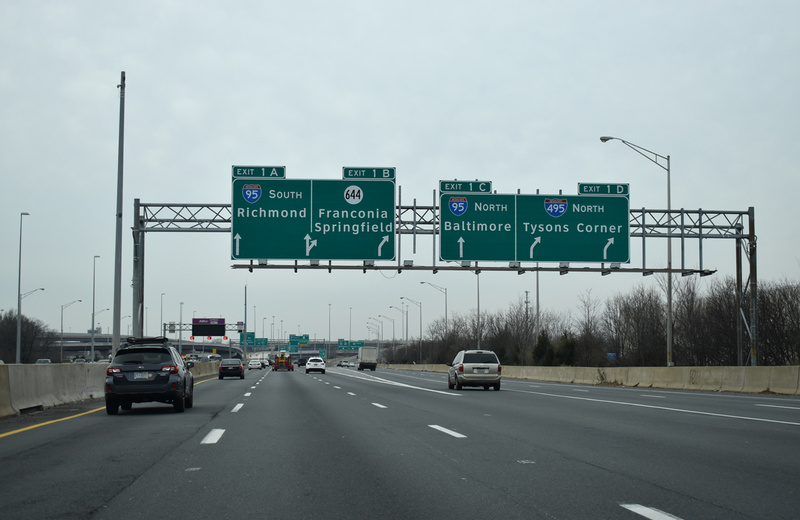 Interstate 395 joins Fairfax County and the cities of Alexandria and Arlington in Northern Virginia with the District of Columbia. The freeway extends northeast from the Springfield Interchange with the Capital Beltway (I-95/495) along the Henry G. Shirley Memorial Highway. Crossing the Potomac River into Washington, I-395 travels along the Southwest Freeway to I-695 (Southeast Freeway). 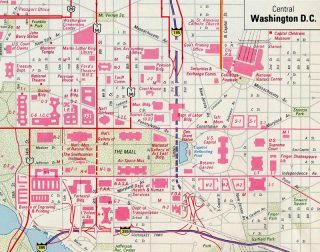 The northern portion of Interstate 395 follows the Center Leg Freeway and Mall Tunnel below the National Mall by the Capitol Reflecting Pool, just west of the U.S. Capitol building. The Center Leg Freeway emerges from the 3rd Street Tunnel at U.S. 50 (New York Avenue). 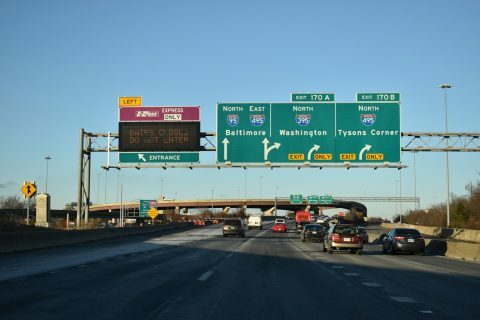 Express lanes run between the north and southbound roadways along Interstate 395 through Northern Virginia. Previously high occupancy vehicle (HOV) lanes, construction underway from 2017 to 2019 expands the two-lane reversible roadway to three lanes and converts their operation into a toll facility. Included within the 95 Express Lanes Comprehensive Agreement with Transurban, work on the I-395 Express Lanes Extension rebuild eight miles of roadway. The high occupancy toll (HO/T) lanes require drivers to have an E-ZPass or other eligible toll transponder. Eligible HOV traffic can use the lanes free of charge with an E-ZPass Flex transponder with the HOV mode set. Construction started in July 2015 added a deck above the Center Leg Freeway supporting the Capitol Crossings development at Massachusetts Avenue. Costing $200 million, the lid joins an area bound by Massachusetts Avenue and 3rd, 2nd and E Streets.1 The four phase, $1.3 billion Third Street Tunnel project runs through 2019. The entire length of Interstate 395 through metropolitan Washington, D.C. is part of High Priority Corridor 33: Capital Gateway Corridor. Interstate 195 shown on the Center Leg Freeway in 1987. Similar to Interstate 180 in California, while approved by AASHTO, neither it nor I-195 were ever signed in the field. 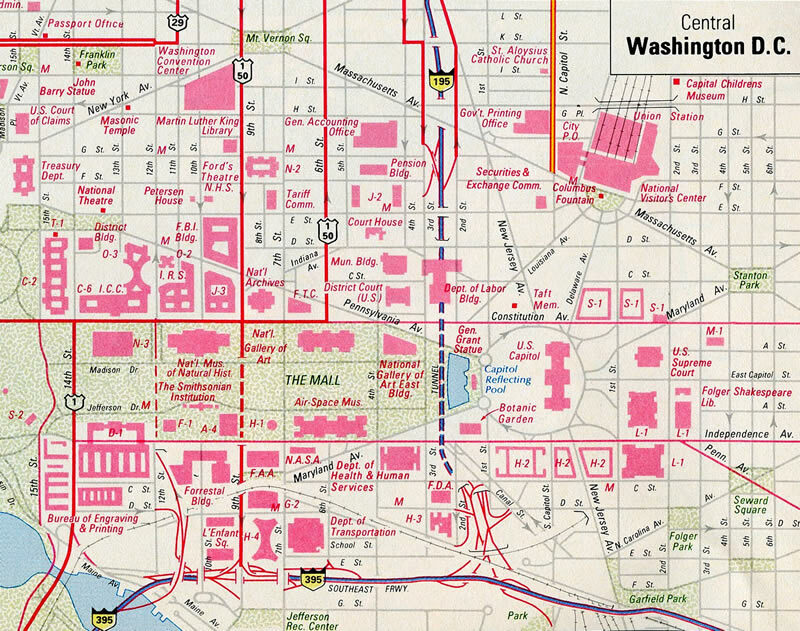 With cancellation of the Center Leg Freeway north to unconstructed sections of both I-66 and I-295 (East Leg Freeway), Interstate 95 was rerouted onto the Capital Beltway in 1977. The former route along the Shirley Highway and Southwest Freeway was reassigned as Interstate 395. This was previously approved by AASHTO on November 11, 1975, but with the conditional designation of Interstate 895. 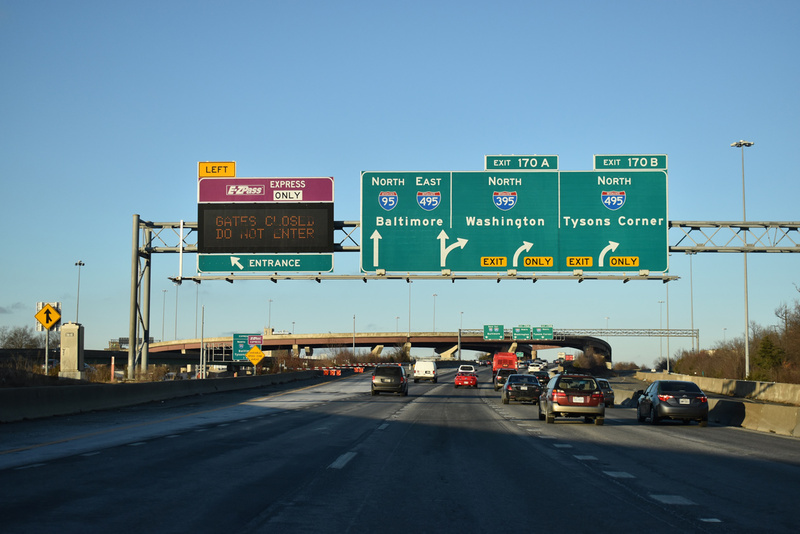 The I-395 numbering was subsequently approved on November 12, 1976. A District of Columbia proposal in 1984 outlined numbering changes for both the Center Leg and Southeast Freeways. 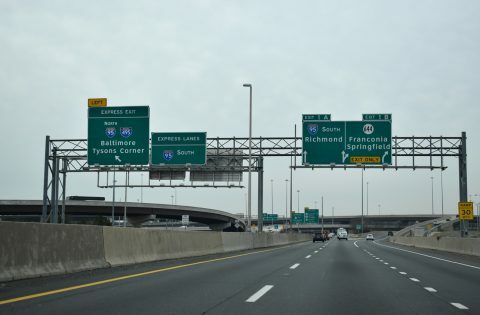 Realignnment for Interstate 395 would replace both unsigned routes of I-695 and I-295 along the Southeast Freeway east to Capitol Street. Interstate 195 would be established along the Center Leg Freeway north from the Southwest Freeway to U.S. 50 (New York Avenue). The renumbering request to AASHTO was approved by the Route Numbering Committee on May 23, 1984. However the changes were never implemented on area roads. The Interstate 195 proposal took place during work to complete the Center Leg Freeway north of Massachusetts Avenue. Several General Drafting maps and the Rand McNally 1985 Northern American Road Atlas showed the I-195/395 change. The Virginia Department of Transportation (VDOT) Springfield Interchange project rebuilt the substandard cloverleaf interchange joining I-95, I-395 (Shirley Highway) and the Capital Beltway (i-95/495) into a multi level systems interchange. Work was completed in July 2007 after eight years of construction. HOV connections were added later. Prior to their conversion to tolled Express lanes, the HOV-3 lanes along Interstate 395 required vehicles to have three occupants during morning (6:00 a.m. – 9:00 a.m.) and afternoon (3:30 p.m. – 6:00 p.m.) commuting hours. Motorcycles, alternative fuel vehicles and emergency vehicles were exempt from the HOV restrictions.4,5 The lanes were open to all motorists during non peak hours. North End New York Ave – Washington, D.C. Ramps from the Southeast and Southwest Freeways converge ahead of the Mall Tunnel along Interstate 395 north. The Center Leg Freeway proceeds north 1.5 miles to end at U.S. 50 (New York Avenue). Photo taken 12/16/16. Exit 10 to Massachusetts Avenue is the last off-ramp from Interstate 395 north. The ensuing stretch passes through the 3rd Street Tunnel. Photo taken 12/16/16. Traffic defaults onto U.S. 50 (New York Avenue NW) eastbound at the north end of the Center Leg Freeway. U.S. 50 transitions to a freeway in 2.50 miles and leaves the District of Columbia to New Carrollton and Annapolis, Maryland. Photo taken 08/04/13. U.S. 50 (New York Avenue NW) passes between the Meridian at Mount Vernon Triangle development and Yale Stream Landry Condominiums on the block preceding 4th Street NW and Interstate 395 (Center Leg Freeway) south. The U.S. 50 reassurance marker her was replaced with a speed limit 25 MPH sign in 2017. Photo taken 12/16/16. Interstate 395 branches southeast from the crowded intersection joining U.S. 50 (New York Avenue NW) with 4th Street NW. The Center Leg Freeway lowers into the 3rd Street Tunnel at adjacent K Street NW. Photo taken 12/16/16. Approaching the five way intersection with I-395 (Center Leg Freeway) south and 4th Street NW on U.S. 50 (New York Avenue) eastbound prior to redevelopment. Photo taken by Steve Hanudel (08/12/05). U.S. 50 extends east from the I-395 north end toward Annapolis. 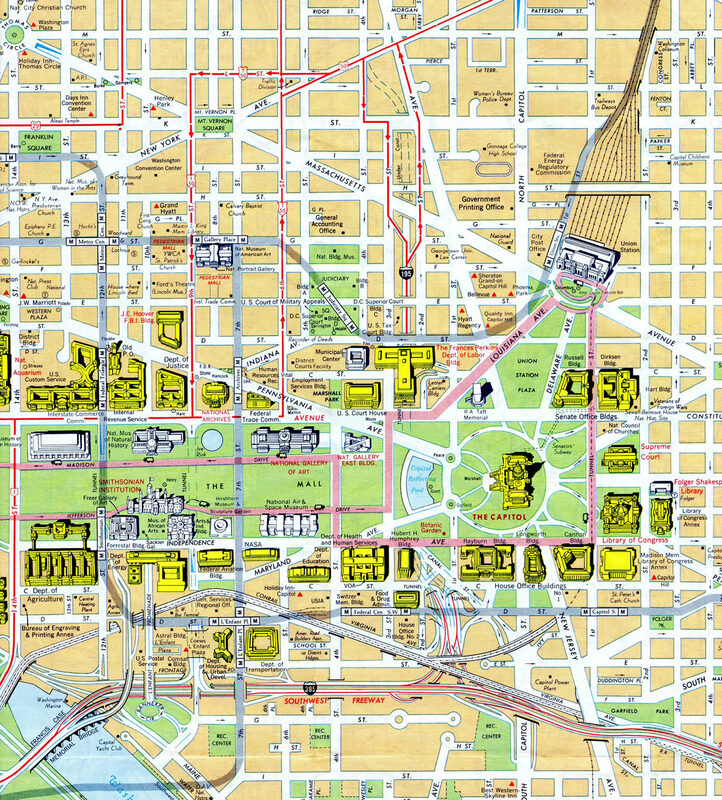 Southward, the Center Leg Freeway takes I-395 under the National Mall to emerge at the Southeast Freeway (Interstate 695) east of L&apos;Enfant Square. Photo taken by Steve Hanudel (08/12/05). U.S. 50 (New York Avenue NW) angles southwest to New Jersey Avenue NW and 4th Street NW, where the Center Leg Freeway begins. I-395 enters the 3rd Street Tunnel to the immediate south below K Street. Photo taken 01/04/19. U.S. 50 (New York Avenue) continues westward from I-395 (Center Leg Freeway) to 6th Street NW, where it combines with U.S. 1 south into Downtown Washington. U.S. 1 and 50 are not posted along 6th Street, instead shields reference I-395 Alternate. Photo taken 01/04/19. Traffic turning south from westbound U.S. 50 (New York Avenue NW) separates for I-395 south and parallel 4th Street SW. Photo taken 01/04/19. I-395 advances a half mile south from SSR 648 (Edsall Road) to the Springfield Interchange (Exit 1). Photo taken 01/04/19. Southbound I-395 expands to five lanes. Three depart at forthcoming Exit 1D/C for the Capital Beltway. Photo taken 01/04/19. I-495 north leads to Tysons Corner and Montgomery County, Maryland. I-95/495 combine east across southern Alexandria to the Woodrow Wilson Bridge. Photo taken 01/04/19. 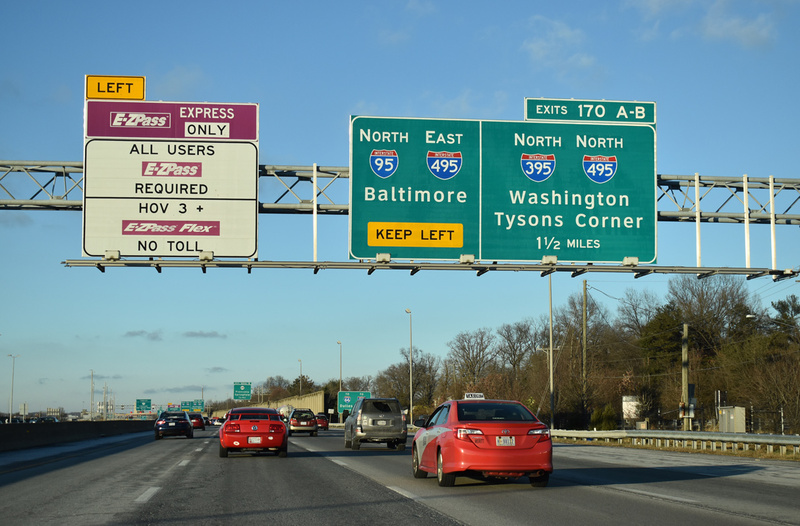 Flyover ramps separate from the I-395 Express Lanes for the Capital Beltway. Photo taken 01/04/19. Interstate 395 separates into roadways for I-95 to Fredericksburg (Exit 1A) and to SSR 644 along Old Keene Mill Road west and Franconia Road east at Springfield (Exit 1B). Photo taken 01/04/19. 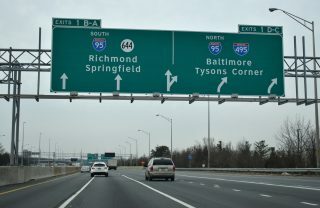 Traffic separates for the Capital Beltway well ahead of the Springfield Interchange (Exit 170) from within the exchange at SSR 644 (Old Keene / Franconia Roads). An ingress point also departs for the I-395 Express toll lanes north to Arlington. Photos taken 12/16/16. 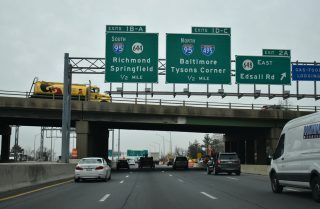 The northbound mainline of I-95 continues onto a two-lane flyover for Interstate 495 east to the Woodrow Wilson Bridge and Oxon Hill, Maryland. 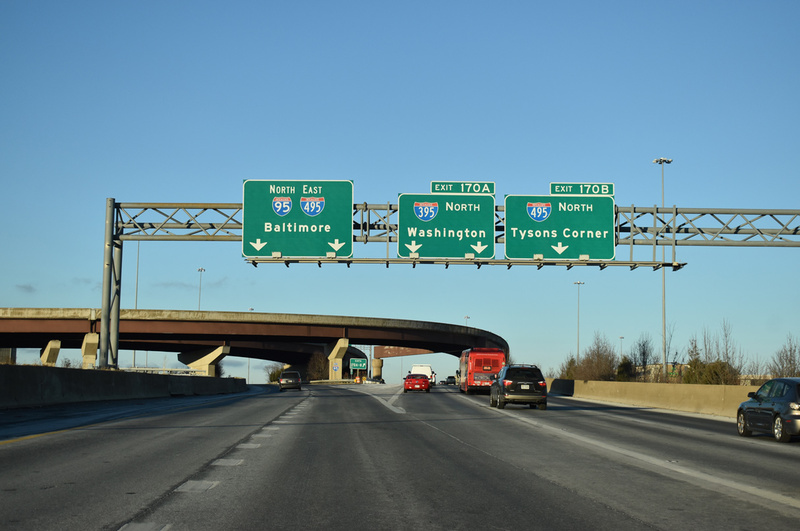 I-395 extends the Henry G. Shirley Memorial Highway north with three lanes to Exit 170B (I-495 north) and Washington, DC. Photos taken 12/16/16. 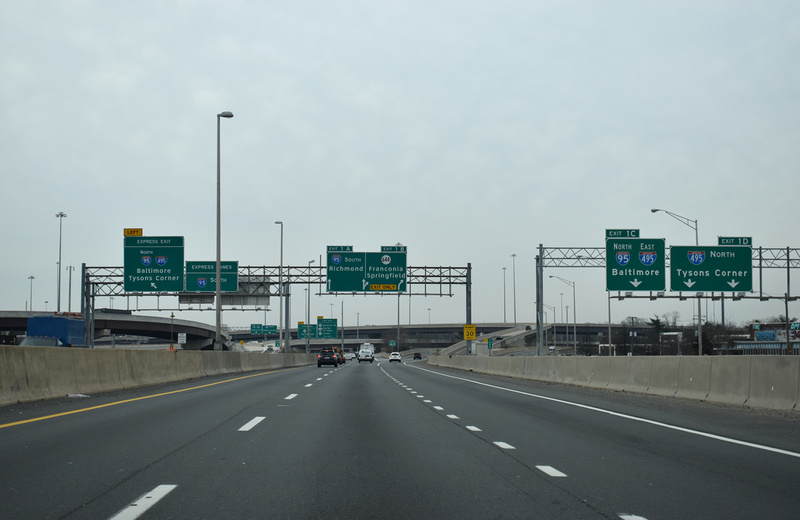 Interstate 95 departs the Capital Beltway via a high two-lane flyover as I-495 continues west to Exit 170B for I-395 north into Arlington and Washington. Photo taken by 12/16/16. More photos from this perspective found at the guide: Interstates 95 & 495 South – Capital Beltway – Inner Loop. Historic photos showing the Capital Beltway west at I-395 are hosted at Interstate 495 / Capital Beltway – Inner Loop (Historical). Traffic bound for Interstate 95 south and SSR 644 (Franconia Road) partitions from the Capital Beltway mainline well in advance of the Springfield Interchange with I-395. Photo taken 12/16/16. Exit 57B to I-395 north departs from I-495 south beyond the separation of Exit 57A for I-95 south to Richmond. Photo taken 12/16/16. More photos from this perspective found at the guide: Interstate 495 / Capital Beltway – Outer Loop. Historic photos showing the Capital Beltway east (outer loop) at I-395 are hosted at Interstate 495 / Capital Beltway – Outer Loop – Archive. Interstate 395 south at Exit 1B/A during construction to upgrade the Springfield Interchange into a systems exchange. Photo taken by Steve Hanudel (08/12/05). Exit 1B formerly comprised a loop ramp from I-395 south to I-95 north/495 east to Prince George’s County, Maryland. Photo taken by Steve Hanudel (08/12/05). Interstate 95 north approaching the Springfield Interchange during the seven year reconstruction of the freeway at SSR 644 and the Capital Beltway. Photos taken 06/02/03. “Major work for Capitol Crossing project is set to begin on I-395.” The Washington Post, June 23, 2015. Henry G. Shirley Memorial Highway, Roads to the Future (Scott Kozel). Center Leg Freeway (I-395), DCRoads.net. Scheulen, Jeff, “AARoads feedback: HOV on I-395 / I-95 in Northern Virginia,” Personal Email, February 15, 2007. Virginia Department of Transportation (VDOT) Travel Center: High Occupancy Vehicle (HOV) Systems. page accessed August 25, 2007.